Limited Time offer - PremiumSlides Ultimate World Map Kit - NOW grey version included as well! The PowerPoint World Map Templates are fully editable in size and color. Highlight specific locations with more than 50 markers and pointers. Show sales and margin trends of several countries in the excel based micro charts. All maps show the country names; continent maps show capitals as well. The powerful How to Guide shows how to create customized maps for your presentations. Map versions of all 6 continents are also included. All continent countries can be selected through selection pane as well. World Map Special Kit! Value: $441! This great Map Kit for PowerPoint includes templates of World, Europe, Africa, South America, Norht America, Australia and great Markers and Charts. All templates are fully editable in size and color. The highly detailed PowerPoint maps are fully editable in size and color. Every country can be extracted or highlighted. For your convenience many sample maps are already included. They show you how to present your data the right way. Do you know how many countries and capitals exist in our world? You don't need to know, because the ultimate World Map Kit already includes so many Country and Capital name tags. There are different views for country names and capitals which creates a clear overview for your maps. Have a look at the country list, which countries can be selected. Many important city and countries names are already tagged on the map. Just select the map you like and paste it in your own PowerPoint presentation. 6 Continent Maps included - Not just a World Map! Most World Map Templates you find on the web are sold with just one editable World Map, which does not even have country name tags on it. We added maps of 6 different continents with country and capital name tags. This gives you the opportunity to have a closer look at specific world regions. You see them Google Maps and magazines every day. Professional markers and pointers on maps. Now you can show regional offices, travel routes or upcoming target markets. The 50 markers will help your to highlight specific locations. All markers are fully editable in size and color as well. 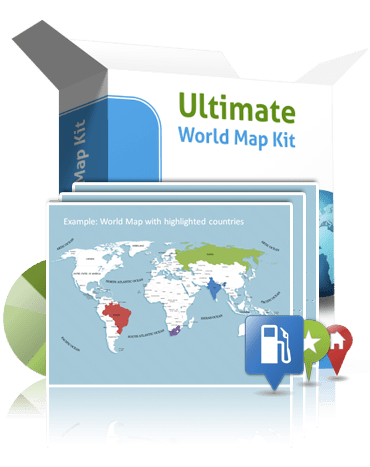 The Ultimate World Map Kit is optimized for PowerPoint 2007-2013 and even PowerPoint for Mac. In Mac Version the Selection List Feature is not supported. A World map pptx presentation format is included for maximum PowerPoint features. This big package does not stop! You'll never stand alone. The premium How to Guide in pdf format shows you how to create your custom maps easily. For your convenience all maps are upgraded with an alphabetical sorted selection list. So you can select your countries through your selection pane and colorize them with just one click. Watch Video to see how easy it is! Selection list is not supported in Mac Version. Why should you buy here and no where else? You get the best value for the best price ! No where else will you get this exclusive PowerPoint World Map Kit for a better Price! You receive not just a simple PowerPoint World Map , you receive World Maps and Continent Maps including 44 Slides! All Capital and Country names are labeled already. Detailed continent map templates show all the information you will ever need for your presentations. You do not have to pay extra money for country selection list ! The alphabetically sorted selection list for PowerPoint maps works awesome! You are not being charged extra money for the 50 Markers . Show any location, route or target on your PowerPoint maps. You receive not just a simple PowerPoint World Map, you receive World Maps and Continent Maps including 44 Slides! Add your own data in micro charts with just one click. No styling , no new skills required. Everything is based on standard Excel ! You will never stand alone! The extensive How to Guide helps you to create even better and nicer PowerPoint maps every day! Questions about Ultimate World Map Kit? Premium PowerPoint World Map Template. This extensive PowerPoint World Map shows countries, country tags, city tags and includes microcharts and map markers.